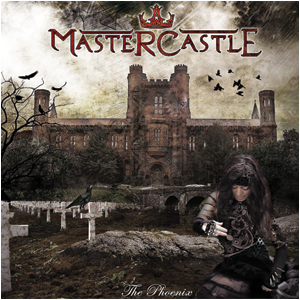 MASTERCASTLE, the new project featuring LABYRINTH guitarist Pier Gonella, will release its debut album, "The Phoenix", on April 19 via Lion Music. According to a press release, "The Phoenix" is "a potent slice of metal with neo-classical and traditional metal influences within its ten songs. The guitar work of Pier is sure to please fans of the likes of Yngwie Malmsteen, with its strong riffs and explosive lead work. Giorgia Gueglio's vocals are equal to task of matching Gonella's guitar work with their great power and soaring qualities and also serve in giving MASTERCASTLE their own unique sound. MASTERCASTLE are completed by the rhythm section of bassist Steve Vawamas and guest drummer Alessandro Bissa a.k.a. Bix (VISION DIVINE) who combine to create a solid backdrop for all tracks. The lyrics for the album by Giorgia Gueglio are mostly influenced by human nature as well as forgotten tales and events. For example, the song 'Greed Blade' tells about the disaster of Vajont, a dam on the Italian alps that after a landslide, created a giant wave that destroyed towns and villages and villages in the valley. The title track, 'The Phoenix', tells a story human nature that need to be as strong as the phoenix, the legendary bird that dies and is born again on his ashes. The song 'Princess Of Love' is a mystical tale about the magic presence of a clan of witches dancing in the forest." For more information, visit www.myspace.com/mastercastle.